As the battle to retake the Iraqi city of Mosul intensifies, more than half a million children and their families are at extreme risk. Above: A newly displaced woman carries a child at a check point in Qayyara, south of Mosul. Check back here regularly for the latest on Mosul: Rolling updates from UNICEF Iraq. As the battle between coalition forces and ISIS intensifies in Mosul, more than half a million children and their families in the Iraqi city are facing extreme risks and hardship. 1. What Is The Situation for Mosul's Children? Since ISIS took over Mosul, Iraq's second largest city, during the summer of 2014, Mosul's children have endured brutal rule by militants, and frequent exposure to violence as Iraqi forces fight to retake surrounding towns. Some have even been reported to have been recruited as spies and soldiers by ISIS. Scores of young children have run out of water and died along perilous mountain and desert paths or have been killed after stepping on landmines as families try to escape fighting on the road to Mosul. Children are walking barefoot for over 36 hours while trying to escape; others arriving at displacement camps with severe dehydration. 2. How Many Children Are in Harm's Way? The offensive by Iraqi Forces to retake the city of Mosul and surrounding areas is expected to affect between 1.2 to 1.5 million civilians. Of those, up to 1 million people could become displaced. Approximately half of these could be children. Overall, some 4.7 million children are affected by the violence and instability in Iraq. About 1 million school-aged children have been displaced within the country. 70 per cent have missed a school year. 3. What is UNICEF Doing to Help? UNICEF has set up camps like Khazir and nearby Hasansham camp to shelter the thousands of displaced children fleeing Mosul as Iraqi forces push into the city. UNICEF plans to meet urgent needs with these facilities for children that combine non-formal learning and child protection with psycho social programs, music, English, games and recreation. After the battle began, UNICEF, in partnership with Iraq's Ministry of Health and the World Health Organization (WHO), launched a weeklong nationwide campaign to immunize Iraq’s children against polio. Under the slogan “two drops can change a life,” the five-day campaign aims to reach an estimated 5.8 million children below the age of five in Iraq, regardless of previous vaccination status. Only days after the battle for Mosul began, UNICEF workers carried out polio vaccination in a newly-retaken village called Khalil Al Ibrahim, near Mosul. In preparation for the Mosul battle, 60 mobile team staff were trained by UNICEF on child protection and psychosocial care techniques. UNICEF has prepositioned enough water, showers, latrines and hygiene kits for over 150,000 people immediately with plans to reach over 350,000 over the next few weeks. Just this week, UNICEF managed to reach Al Houd, a town south of Mosul that was retaken by Iraqi security forces two days prior, and delivered clean water to some of the thousands of families caught up in this conflict. “This means that for one week, we have managed to help the lives of 3,000 children and their families who have been the victims of the terrible conflict that has swept over much of Iraq,” said Peter Hawkins, UNICEF Country Representative in Iraq. Throughout the country, UNICEF is supporting health and nutrition services for children, trucking in hundreds of thousands of liters of water to families recently displaced by fighting, and distributing food, water and emergency kits. UNICEF is also providing vaccinations, educational opportunities for children and adolescents, and is creating child-friendly spaces at the many camps for the displaced. “A lot of these children are in a state of shock; all they need now is a safe space to play, learn and aspire,” said Hawkins. In addition, UNICEF is supporting cash transfers to meet families’ daily needs and cover the cost of children's schooling. Providing for the hundreds of thousands of children expected to be affected by the fighting in Mosul will be extremely challenging. Your donation will help UNICEF as it strives to make sure that education, health care, clean water and nutrition are available to every Iraqi child put at risk. 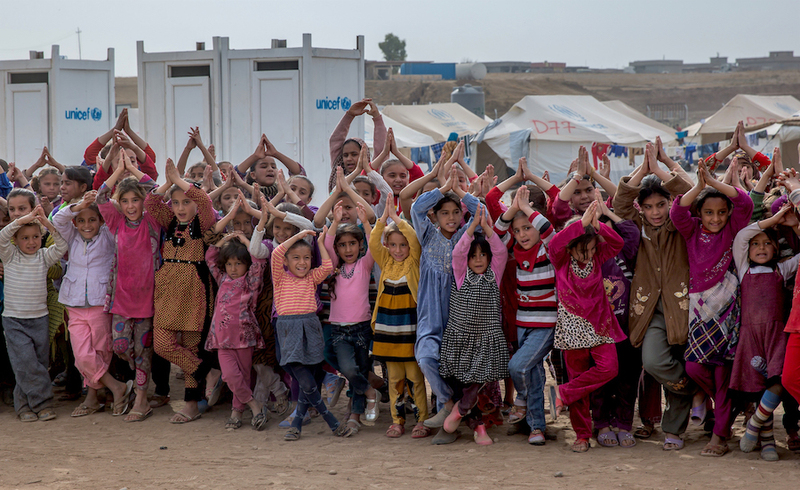 Stand for Hope: Support UNICEF's efforts to protect Iraq's children.